Belkin's Universal Secure KVMs are purpose-built to allow disparate systems to share the same peripherals and still maintain air-gap isolation, providing increased assurances that the user desktop is safe from vulnerabilities. 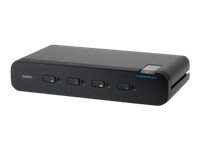 The addition of auto sensing combo ports for video eliminates compatibility problems between KVMs and the systems and monitors connected, allowing for easier deployment and upgrades, and lowering the Total Cost of Ownership throughout the life of the KVM. Delivering up to 4K resolution at 60hz, the Universal Secure KVM portfolio insures that as the desktop performance demands increase, the KVM will support user needs now and into the future. The universal secure KVM and its accessory cables are another example of the innovation Belkin delivers as part of its cybersecurity solutions for mission-critical systems.